The big news this morning is Super Typhoon Haiyan smashing into The Philippines, sending more than 100,000 people scrambling for safety, and stranding thousands of travelers. 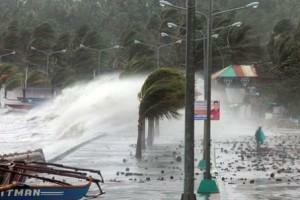 Manuel Mogato and Rosemarie Francisco report for Reuters on what is being called the strongest storm in recorded history. Flights have been canceled, and, from the sounds of things, the damage could be extensive and make it very difficult for travelers to get home. If you have loved ones visiting The Philippines, be sure to stay tuned to the latest news. Now on to less serious stuff. True fact: You can’t live without your smartphone. We know this to be the case. And when you’re preparing for a trip abroad, you need to consider the importance of your phone in your life. When you’re traveling, your phone becomes an indispensable information source. At USA Today, Caroline Costello offers up some critical tips on prepping your smartphone for your trip. For people who choose to move abroad, the health system of their destination country is a factor they need to consider. But how big a factor should it be? At Expat Health, Andrew Watling examines whether wannabe expatriates should pay much attention to the World Health Organization’s global health rankings. If you’re headed to the United Kingdom for the first time, Barry Neild has a primer for you at CNN on how to survive Jolly Old England – everything from navigating the tube to understanding the telly. Airports can often seem like a circus, but how about a zoo? The Wall Street Journal’s Scott McCartney looks at Frankfurt International Airport’s Animal Lounge. It’s the largest animal airport facility in the world, handling everything from goldfish to elephants. And, finally, this story appeals to me because the exact same thing happened to me 12 years ago. My wife and I were headed to a vacation in San Miguel de Allende. Life was frantic leading up to the trip, and planning was minimal. On the plane, I asked her “hey – do you speak any Spanish?” Err… no. Fortunately, we had a foundation of being able to say “dos Coronas,” and went from there. This week at World Hum, Kristen Van Tassel writes about being in San Miguel without really being able to speak the language. Image by Charism Sayat, AFP/Getty Images.